The lives of a township family in Bulawayo, Zimbabwe are turned upside-down their son joins the local youth militia. Mr. Mlalazi is an internationally known Zimbabwean writer. He was guest writer in Hanover Germany, a fellow at the Iowa International Writing Program, and a guest writer at Villa Aurora in Los Angeles and at the Nordic Africa Institute in Sweden. He was awarded the Oxfam Novib PEN Freedom of Expression Award, and a NAMA award for his short story collection and other works. His writings have been translated into German and Italian. 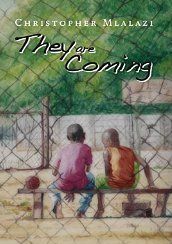 They Are Coming is, essentially, the story of a prodigal daughter of a family living in Bulawayo in post-independent Zimbabwe. Her story is told by an anonymous narrator, with additional personal dialogue and description by the main characters. The basic, general theme is the conflict between young people devoted to the national political party versus the hopes and desires of their parents. Senzeni, the prodigal daughter, has left home and is a member of the Green Bombers, the raucous, militant youth wing of the governing party. Because of this, she is alienated from her mother, father and brother, who long for her to return to the family home in the Bulawayo township where they live. Several references in the story familiar to readers from southern Africa, would not be understandable to most European or American young people. These include the acronyms: ZJC, MNC, ZIPRA, ZANU-PF and others that refer to the educational system and to recent political and military history of Zimbabwe. Mlalazi also uses Sindebele words and references to traditional beliefs of the Matabele people; these, too, are not well defined and may leave the non-southern African reader wondering what they mean. There is no glossary in the book, so the reader must seek out the meaning of these references, which are important to the story, without the help of the author’s text. The narration jumps from present to past and from the episode of one character to another, often with little warning to the reader. Sometimes the characters of one paragraph are not the same ones in the next; this becomes distracting. It also interrupts the flow of the action and how that action relates to other characters’ circumstances in another portion of the book. The author’s political position appears to come across through his sympathetic portrayal of the plight of the family at the apparent loss of their daughter and through her joyful, tearful, turn-about return at the end of the story. Mlalazi’s portrayal of the Green Bombers is totally negative, and his development of the teacher who is a member of the opposition party is sympathetic. I would not be surprised if this book were banned in Zimbabwe. I give this book two stars because it presents significant problems, detailed above, for readers unfamiliar with southern African history and politics. Few teachers in the US will have the necessary background to interpret the author’s references For readers familiar with post independent Zimbabwe, it is a sweet read. Reviewed by Marylee S. Crofts, Ph.D.